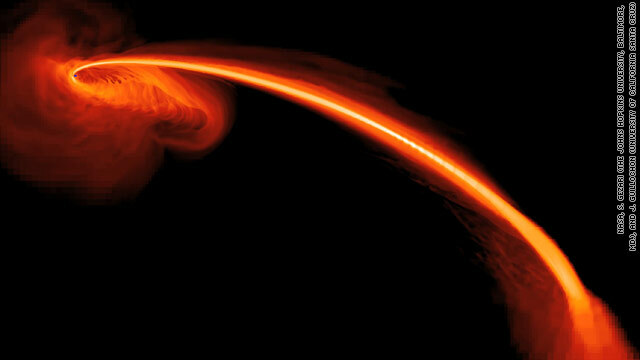 Simulation of a black hole flare. Astronomers know that stars coming too close to the super-massive black holes at the center of most galaxies get ripped apart by extreme gravitational forces. They've even seen it happen, but up until know, scientists hadn't ever been able to tell what type of star got annihilated. Suvi Gezari, from Johns Hopkins University in Maryland, and her team of astronomers used a series of of telescopes both on Earth and in space to study the swallowed star, which is located in a galaxy 2.7 billion light-years away. Gezari likens her study to "gathering evidence from a crime scene." Using spectroscopy to study the flare emitted by the gas being sucked into the black hole, as well being ejected from the black hole at high speed, astronomers can see that the gas is made up primarily of helium, marking the gravitational victim as a red giant star. Observations of this tidal flare yielded insights about the environment around the super-massive black hole and the stars that orbit around it. A similar system is expected to exist at the center of our own Milky Way galaxy. Gezari and her team were studying a previously dormant black hole, looking for a spike in ultraviolet light, when they discovered this event. Stars getting stripped by super-massive black holes are relatively rare events - one is estimated to occur every 100,000 years - so the team was monitoring hundreds of thousands of galaxies with two telescopes. The space-based Galaxy Evolution Explorer (GALEX) observed in ultraviolet light while the Pan-STARRS 1 telescope in Hawaii scanned in visible light. The spectroscopic observations were made with the Multiple Mirror Telescope (MMT) Observatory in Arizona. For all the details of the study and its methods, check out the article on Nature (paid access). Any star that "wanders" deserves to be sucked up by a black hole. Stars should obey the laws of physics like everyone else.